I am so excited to share this recipe with Y’All! Did you catch my southern drawl? Well there is good reason. I found a Paula Deen recipe that is absolutely amazing and has become a HUGE favorite in our house. Its just so super yummy. I have Paula Deen to thank for a fantastic new favorite! This recipe is Paula Deen’s Corn Salad. I like to refer to it as Paula Deen Fritos and Corn salad. 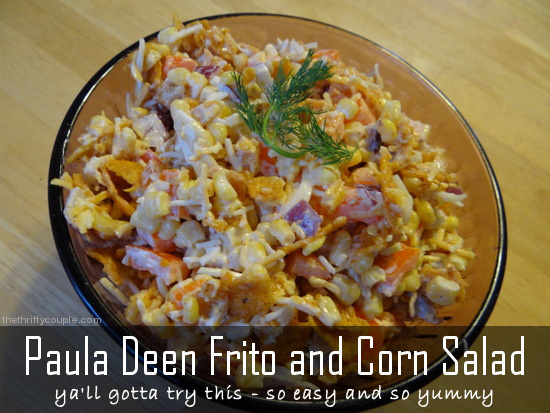 It sounds a bit ironic to put “Fritos” and “salad” in the same title – and honestly, this probably isn’t waistline friendly, but then again – I can’t think of many recipes (or any ;)) that are “waistline” friendly from Paula Deen. But before I thank Paula Deen – I first must thank my fellow mystery church member for this delicious introduction. You see, my girls and I were at our church’s annual ladies tea and this salad was there. I was addicted at first bite and determined to duplicate this at home as I knew that the boys would love it. Plus, Fritos are Alex’s secret indulgence (kinda like dark chocolate, brownies and donuts are mine ;)) and many that know him know that he loves them as he even gets them as gifts. Well, I enjoyed a few servings of this salad at the Ladies Tea (shhh…) but I was so busy gabbing that I was one of the last to leave and never discovered who brought this salad to get the recipe. Plus it is really simple to make and so it is perfect for busy moms. Nearly every recipe I have shared on our site has been my own as I admitted that I don’t follow recipes, just get in the kitchen with what I have and make up something. I also have a few baseline recipes that I can build on to make something new. But in this case, it is too perfect to perfect! I did make a couple of very slight modifications to match whatever it was I had on hand or had recently gotten for cheap! Those modifications are in parentheses and really didn’t affect the taste. So you can use whatever you have on hand and probably have a similar experience! I am not a fan of buying the exact ingredients for a recipe as shopping this way is not budget friendly, but trying to utilize what you already have to make it work! This exact version is from food.com. Check out https://thethriftycouple.com/category/home-life/recipes/ for more yummy and even healthier recipes :)! Have you tried this before? If this is your first time making and trying too, come back and let us know your thoughts! See more of our Recipes to save even more money for a healthier budget and to live healthier lives too! I have made this MANY times and the ONLY time I didn’t get rave reviews was when I used cheap corn, and Kraft mayo. Now I ALWAYS use Hellman’s (original/not low fat), real Fritos chili cheese chips, DelMonte or Green Giant corn (I like the cans of “Fresh Cut” but can’t find them anymore), green onions and I chop some of those little red, orange and yellow sweet peppers, either in addition to or in place of the green peppers. Maybe you have a rough crowd. I have used all kinds of corn, mayo, and off brand corn chip. But of course when trying to push the best I’m sure these have additional flavor . I LOVE THIS and so does my family. I have made this several times. It’s soooo good! The only change to the recipe I do is use frozen corn instead of canned. Tastes so much better that way!!! Thanks for the tip! I picked up frozen today to try! it isn’t the fat or calorie content (if eaten in moderation) you should worry about. It’s the corn! Grains are bad, but again, eaten in moderation, won’t be so bad. Check out NSNG @ http://www.vinnietortorich.com. Great recipe for social gatherings! Corn is okay, it’s fructose corn syrup that is bad for you. Also, wheat, rye, barley! This looks yummy, but is it a dip or an actual salad? I use Doritos and it is fantastic. ellmans mayo. Place shredded old cheddar cheese on top followed by the whole frito lay chips . I use this at almost every gathering. ALL ages love this. I sometime use the red peppers; sometime omit the purple onion. I do wait until its ready to serve before the cheese and Fritos. I usually double the Fritos and place them around for extra. I’m a lazy cook and just use mexi corn. Then I don’t have to chop peppers! I also add black beans and it almost becomes a meal! I have made this Corn Salad many times. I use Kraft Mayo, I can’t stand Hellmann’s. I add 1 cup plus 2 heaping tbs. and everyone loves it. I also use Del Monte Summer Crisp corn. You need 2.5 cans for one recipe. It’s a great recipe to make for any kind of doings you are going to and need to bring a dish. Always a hit!